Recently, an acquaintance of mine questioned me about the appropriateness of local governments which seek to regulate or modify driving behavior by citizens. Is it any business of government to shape how people travel? Isn’t doing so an illegitimate form of “Big Brother-ism”? I spent quite a bit of time thinking about her questions. I wanted to respond as thoughtfully as I could. I’d like to start by noting, as an aside, that when I was in graduate school for town planning, I fully agreed with her that an essential task of government is to ensure free-flowing traffic and that government had no business influencing citizen behavior regarding driving. 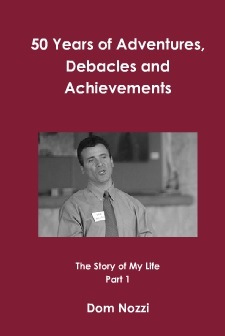 I will attempt in my remarks to condense my 20 years of experience and research as a town planner, my public speaking, and my two published books on the topics of transportation, quality of life, sustainability and urban design. My education and research led me to an “epiphany” with regard to transportation and urban design in 1989. What I came to learn is that much of our on-going (worsening?) problems regarding transportation are due to the fact that so many of the effective remedies are extremely counterintuitive. What I thought was common sense turned out to be counterproductive to achieving community objectives. As it turns out, I was not alone in arriving at the views I now proudly hold. Internationally respected urban design and transportation professionals are in agreement with what I have learned. Names like Duany, Dover, Monderman, Kulash, Lockwood, Burden, Hall, Ronkin, and Ewing, for example. What I’ve learned is that initially, cars were seen as great liberators. As a convenient way for us to travel quickly, conveniently, and long distance. To live away from the crime-, density- and pollution-infested cities. But then enormous problems starting emerging that were not anticipated. There was suddenly a big jump in transportation-related injuries and deaths, largely due to the high speeds and significant weight of cars. Because a person sitting in a car takes up, on average, 19 times more space than a person sitting in a chair, roads quickly and often intractably became congested with only a tiny number of travelers on a given road. The enormous size and speed of the car has led cities to create gigantic and over-lit spaces in cities. Asphalt parking lots and roadways, to accommodate cars in cities, incrementally started consuming more land than buildings, parks and other people spaces. Growth in cars in the early part of the 20th century grew exponentially, in part because the car creates a “self-recruiting” vicious cycle. The large parking and road space needed by cars, the sprawling dispersal of the community enabled by the car, and the dangerous speeds of the car means that fewer and fewer could continue to travel by foot, bicycle or transit. Increasingly, more and more citizens were forced to travel by car because other forms of travel were increasingly impractical and unsafe. An important reason for the growth in the car in the 20th century – besides cheap oil – has been the enormous subsidies provided by the federal, state and local government for a car-based lifestyle. Home loans and mortgage tax deductions were almost exclusively made only available to remote suburban housing. Gasoline prices are heavily subsidized by being much lower than they would be if their full costs were included (gas taxes pay well under 40% of car costs), and free-to-use highways and local roads profoundly influenced Americans to rationally choose car travel. By far, the most significant subsidy in America is the provision of free parking. Over 98 percent of all car trips in the US end at a free parking space – space that is quite expensive, but hidden from the motorist (so it seems free, when in fact the price is just passed on to other costs, like the cost of milk or the cost of a haircut). The astronomical welfare subsidies for cars, combined with the vicious cycle that continuously recruits new motorists (who were formerly walking, bicycling or using transit) has artificially created a massive rate of car ownership in the US – far in excess, per capita than most anywhere else in the world. The rate of American car ownership and use is far in excess of what would have occurred based on choices people would normally or naturally make. In essence, then, the huge government subsidies and massive, colossally expensive car infrastructure, as well as severely underpriced gasoline and tax breaks, has created, by far, the most substantial form of human behavior modification in travel (or “social engineering” or “big brother-ism”) that the world has ever seen. A major unintended consequence of the introduction of cars as a way to travel has been that in cities, cars are a (or the) leading cause of air pollution, water pollution, strip commercial blight, loss of a charming and lovable community character, injuries and deaths, decline of town centers, local economic woes and loss of jobs, financial woes for households and local governments, light pollution, noise pollution, and loss of wildlife habitat. One tragic outcome of the vicious cycle referred to above (the inexorable recruitment of new motorists on an on-going basis) is that because such a high percentage of us are now obligated to make most all our trips by car, most all of us are (artificially) compelled to urge our elected officials to continuously promote easier car travel (it is, after all, our only way to get around, given how we have designed our communities). Yet doing so compels us to become our own worst enemy, as promotion of car travel is a zero-sum game. Nearly always, “improvements” for cars results in degradation of the “habitat” for people, because cars and people have nearly opposite needs. Car travel requires sprawling, ubiquitous asphalt parking lots that deaden places, harm our environment, degrade town centers and neighborhoods, substantially raise costs for houses and businesses, and make people feel less safe. The wide, multi-lane, high-speed roads needed to maintain free-flowing traffic for space-consuming cars are too dangerous and unpleasant for most pedestrians, and are too hostile for healthy retail or residential (too often, then, many roads become blighted, Anywhere USA strip commercial corridors that no one can love). Car travel introduces, by far, the biggest source of noise pollution of any source in a city. Their size and speed require glaring, excessive lighting that intrudes on neighborhoods, and degrades community ambience. 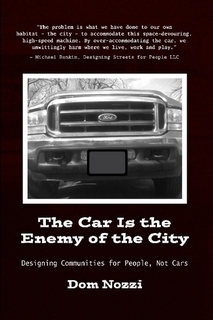 In sum, car-friendly design we are compelled to urge be built reduces property values, bankrupts governments and households, promotes unaffordable suburban sprawl, destroys quality of life, kills over 40,000 Americans per year, fragments and destroys countless wild animals in road kills, is a prime contributor to air and water pollution, and raises taxes. The financial burden cars impose is particularly acute. Road modifications by local government are astronomical in cost. The only reason road construction does not seem unaffordable to local government is that, typically, state government picks up 80 percent (or more) of the tab. Not only is the gargantuan cost of road widening and maintenance bankrupting all levels of government, it is also unaffordable for a huge percentage of households, which must own two, then three, then four, and sometimes more cars (each car now costs over $8,500 per year to own and maintain). Why so many cars? 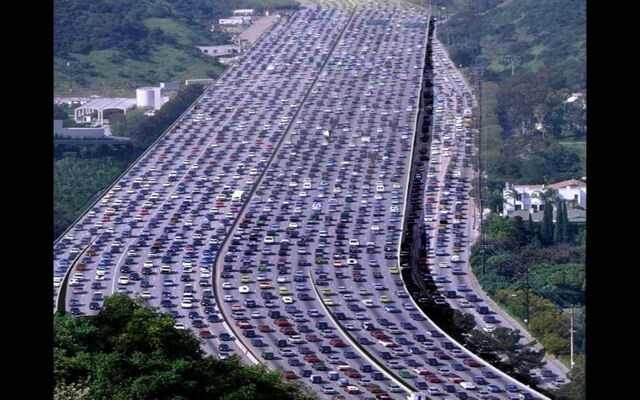 Because on average, a household must make 14 car trips per day. Another key reason the financial burden for households is so burdensome is that car travel has been largely privatized. Approximately 100 years ago, about 1-2 percent of the average household budget was allocated to transportation. Today, that percentage is 22 percent and rising (over 30 in some cities). That cost is simply unaffordable for a huge number of families, and helps explain the enormous affordable housing crisis. Economists have long known that cities, to be healthy, must leverage “agglomeration economies.” That is, cities are healthier when goods, services, jobs, culture, and homes are in reasonably close proximity. Yet because of their speed and the huge roads and parking lots provided to them, cars powerfully and toxically disperse the city. The relatively high levels of car use in the US results in an enormous annual consumption of oil. Since a large percentage of this oil comes from overseas, a large amount of American dollars are shipped overseas. With the looming crisis of world “Peak Oil” growing on the horizon, this oil dependency is particularly worrisome for the sustainability of American society. The loss of transportation options created by car-based design (which makes non-car travel too unsafe or impractical) has resulted in an enormous loss in independence of travel. Over 30 percent of all Americans do not own a car, or cannot drive a car. Disproportionally, this includes older adults and children, many of whom find their lives severely diminished because they cannot get around on their own due to lack of access to a car. Retail health, public safety and transportation choice also depends on slower-speed travel. Yet car travel induces us to move at very unsafe, unpleasant, inattentive speeds that undercut these important objectives. Given all this, it is clear that car dependency grows inversely with quality of life, financial health and community sustainability. The more dependency grows, that is, the worse these important community objectives become. And a very large percentage of America’s large and growing dependency on car travel is fueled by enormous government subsidies and car-based design. A growing number of cities are fortunate enough to elect leaders able to steer the community toward a return to the timeless tradition of designing for people instead of cars. Roads are being put on a “diet” (commonly 4 lanes to 3), one-way streets are being returned to two-way, traffic calming is increasingly used to slow cars, parking is being provided more efficiently, neighborhoods are being more walkably built, and highway overpasses are being removed to instead create more humanized, lovable boulevards. In most or all cases, such changes have resulted in overnight improvements in residential and retail health, increased safety, improved local economy, and overall improvements in quality of life and civic pride. Given the above, I have joined other town planners in supporting and recommending tactics intended to make people happy, not cars. I am not at all a supporter of “Big Brother” tactics or other forms of compulsion or coercion. In a free society, it is best to use what has been called “libertarian paternalism,” which “prods” citizens toward behavior that is conducive to community-agreed-upon objectives without force or laws. In other words, behaviors known to be harmful can still be chosen, but doing so is discouraged because price signals increase the cost of doing so. An important lesson that the Soviet Union taught us is that socialist economics is unworkable for an economy. Bread lines are the inevitable result of underpriced bread. The Soviets believed the solution to alleviating long bread lines was to make more and more free bread. But the bread lines persisted, no matter how much free bread was provided. Similarly, we can see that socialism results in failed transportation in America. For over 80 years, Americans have believed that more and more widening of free-to-use roads and parking lots would alleviate traffic congestion and lack of parking. That we should maintain underpriced roads and artificially low gas prices. But like the Soviets and their bread, underpriced gas and the never-ending widening of underpriced roads and parking inevitably result in congested roads and unavailable parking (congestion is the American version of Soviet bread lines). Simple economics informs us, as it is informing Russians, that the only way to fairly and sustainably allocate scarce resources is to properly price the resource based on willingness to pay. Another negative consequence of the over-use of cars is the loss of lifestyle choices. In nearly all American communities, land development regulations are a one-size-fits-all proposition. And that one size tends to be to provide for the drivable suburban lifestyle. Such an approach fails to fairly provide for all lifestyle choices. A much more equitable, sustainable approach is to establish lifestyle “zones” throughout the community that are intended for a walkable town center lifestyle, another for a drivable suburban lifestyle and another for a rural/conservation lifestyle. Each “zone” is then given customized land development regulations that are tailored to maximize the quality of each lifestyle. (For example, a town center zone would have smaller building setbacks, somewhat higher density allowances, more mixing of residential and non-residential uses, and lower speed road design than in the suburban zone.) This more comprehensive, choice-based regulatory approach is slowly being incorporated in American communities, and is known as “form-based” zoning regulations, or “transect-based” regulations, or “smart growth” codes. It is, in effect, a way to make smarter, more lovable development legal again. And to do so in a way that maximizes lifestyle and travel choices. Given the above, what is to be done? Is it any business of government or its planners to intervene in how much people drive cars? In my opinion, a strong case can be made that such intervention, properly crafted to avoid eliminating choices so essential to a free society, is quite legitimate and increasingly essential. After all, governments have a constitutional and ethical responsibility to provide for community health, safety and welfare of the community. I’d like to note here, as an aside, that in my 20 years as a senior planner for Gainesville FL, I discovered that nearly all the work that planners are asked to do in their jobs to promote health, safety and welfare either directly or indirectly relates to the alleviation of problems associated with car travel and storage. The solution is not to prohibit the car. The solution is to continue to allow the car. As long as the car pays its own way, and behaves itself, by being a lower speed, less obligatory way to travel – particularly in neighborhoods and town centers. For starters, we need to level the playing field. Massive government subsidies for car travel and the drivable suburban lifestyle have strongly distorted the market demand for such travel and such a lifestyle. There is an artificially high level of car travel that would not occur anywhere near the levels we see in America if it were not for the huge government subsidies. These subsidies, for both fairness and financial health, need to be minimized or eliminated. Gas taxes and other user fees such as priced parking and congestion fees should pay for more than 40 percent of the costs cars impose on society. Roads and parking should be much more efficiently provided, and increasingly priced based on willingness-to-pay, rather than the failed approach of providing these extremely expensive facilities in endless abundance, and for free. Road widening should be halted, given the unfairness of how they are paid for (only a small portion is paid by motorists), the extent to which oversized roads destroy community quality of life and promote auto dependence, and the increasingly unaffordable cost of widenings. Because of the several decades of government subsidies, Americans have significantly over-built roads and parking so that they are frequently over-sized. Countless roads and parking lots need to be put on a diet (4 lanes to three lanes for many roads, for example). For so many reasons, we need to shrink the space allocated to cars and allocate more of it to bicycles, pedestrians, transit users, and places for people to live. Over-allocation of wide roads and huge parking lots dramatically reduces transportation choices, lifestyle choices, quality of life, public safety, and financial health, among other things. Transportation choices can be further promoted by having governments change their road construction policies so that all future construction of new and modified roads be built as “Complete Streets.” Instead of our longs-standing convention of building incomplete streets only usable by cars, we need to ensure that future road construction strive, based on the context of where the road is located in the community, to build streets that accommodate all forms of travel. Not just the car, but also bicyclists, pedestrians, the handicapped and transit users. Home mortgage companies should provide “location-efficient” home mortgages where, in recognition of the significantly lower transportation costs of households living in locations richer in transportation choices (and therefore better able to pay a mortgage), mortgage lending to such households is made more readily than to households located in much more expensive, car-only locations. The full range of lifestyle choices should also be provided for to maximize choices citizens have about not only how to get around but how to live. As noted above, this can be achieved by establishing context-sensitive “transect zone” development regulations, so that new development provides quality options for not just a drivable suburban lifestyle, but the rural and town center lifestyle as well. As I noted above, I strongly oppose “Big Brotherism,” or various forms of forcing people to do things “for their own good.” I believe that it is best and most fair to achieve community objectives in such a way that we maximize citizen choices about how to travel and how to live, as long as everyone pays their fair share based on the impact their choices have on society. And again, in my view, that is best done by the use of “libertarian paternalism” strategies. Prodding people, when necessary, towards mutually agreed upon community objectives through tactics such as price signals, while retaining freedom of choice about how to get around and how to live. An obvious question arises at this point: How do we arrive at “mutually agreed upon community objectives”? We do so through our democratic form of government, where we freely elect representatives who we believe will best represent and achieve our community goals. We live in troubled, turbulent, transformative times. Global warming (and countless other environmental troubles), severe economic and financial woes, and looming Peak Oil are all converging on us to the extent that we can no longer afford to privilege, enable, heavily subsidize and otherwise promote – almost single-mindedly – a world of happy cars. Market-distorting subsidies for cars create an artificially high demand for car travel and suburban living. By doing so, such subsidies create powerful social engineering effects and substantially reduce travel and lifestyle choices. Our health, safety and welfare are severely diminished when we put cars on welfare, and it is the responsibility of government to equitably reduce and ultimately eliminate unfairly subsidizing and conveniencing the car. I believe we need to instead return to the timeless tradition of making people happy, not cars. To a tradition that will allow us to build lovable communities that induce civic pride. To a tradition that maximizes travel and lifestyle choices, rather than forcing all of us to be suburban motorists. Who is Neglected More? Pedestrians or Bicyclists? I was a city planner for over 20 years in Gainesville FL and Boulder CO. I’ve also read huge volumes of books and papers regarding pedestrian and bicycle transportation. In addition, I’ve visited countless cities throughout the US and Europe. As I have noted in both my published book, it is pedestrians who are mostly neglected in cities, not bicyclists. Which makes sense, if one considers the political situation, as in all my years on this issue, I’ve never come across a pedestrian advocacy group or a pedestrian advisory board for a local government. On the other hand, it seems that thousands of towns/cities have bicycle advocacy and advisory groups. Given the existence of thousands of bike advocacy groups and almost zero pedestrian groups, how can it possibly be that bicyclists are neglected and pedestrians get all they desire, as is sometimes claimed by bicycle advocates??? In Gainesville, for example, bike lanes and paths have been built throughout the city. Sidewalk gaps and excessively narrow sidewalks, meanwhile, are everywhere. I never saw a pedestrian advocacy group get up at a public meeting in Gainesville to call for more pedestrian facilities. But almost every month, there were bike groups getting local government to provide for them. Sure, there are lots of bike/ped advisory and advocacy groups, but that is a misnomer for every one I’ve seen. “Pedestrian” is added to the group name almost as an afterthought, but there is no serious consideration given to pedestrians by such groups, nor does anyone in such groups seem to have any wisdom regarding pedestrian design. They tend to all be bicyclists (who are perhaps seeking to be more inclusive by attaching “pedestrian” to their group name). I don’t know why there have been so few ped advocacy or advisory groups. I think there are some in bigger cities, due to the higher number of pedestrians. My guess is that it is more likely that bicyclists will ride recreationally in groups and peds are more likely to walk alone (and have less need for dedicated facilities). I say all this despite the fact that I am a lifelong bicycle commuter and recreational bicyclist. I also wrote a master’s thesis on bicycle travel. Better bicycling facilities are essential in all American cities. I have come to learn, however, that pedestrians are the design imperative in town centers, not bicyclists, if our aim is to improve safety, health, economics, quality of life, civic pride and conviviality. And American is failing miserably in providing a quality pedest rian environment (poor for bicyclists as well, but walking is much more difficult in most places than bicycling). By the way, in my humble opinion, the key for improving conditions for bicyclists and pedestrians: shorter travel distances via higher residential densities and commercial intensities, compact design, and mixed use – all of which come from priced/scarce car parking, and constrained/reduced road sizes. Providing bike lanes/paths or sidewalks does very little to induce walking or bicycling if the travel distances are too large, if roads are too big, and if there is too much free parking for cars. In the great walking cities in Europe, for example, walking rates (and pedestrian enjoyment) are extremely high, yet sidewalks in such cities are often worse than in many US cities. Indeed, Savannah and Charleston are two of the best walking cities in the US, yet their sidewalks are nowhere near the best in the nation. I will admit that US cities are woefully inadequate in the provision of off-street urban bike paths, as many bicyclist advocates often point out. But it is not clear to me that such facilities make sense at all in American town centers. I’m one of those Complete Streets people who believe it is best to design narrow, low-speed streets in town centers. So low-speed that bicyclists can comfortably share the lane with cars. Bike lanes in town centers, in other words, are almost never appropriate. Overall, then, besides the key elements I mention above, the best design approach for bicyclists and pedestrians is via the use of context-sensitive design: Pedestrians are the design imperative in town centers. Bicyclists are the imperative in suburban areas adjacent to town centers. And as I have indicated above, our cities have much more significantly neglected the needs of pedestrians than bicyclists. For our cities to be better places to live, our number one priority is to improve conditions for pedestrians.